LAKE FOREST, Ill. (AP) — The Chicago Bears are rolling into their first playoff appearance in eight years, with nine wins in 10 games and their sights set on a bigger prize after capturing the NFC North. “This is where it gets real,” coach Matt Nagy said Monday. 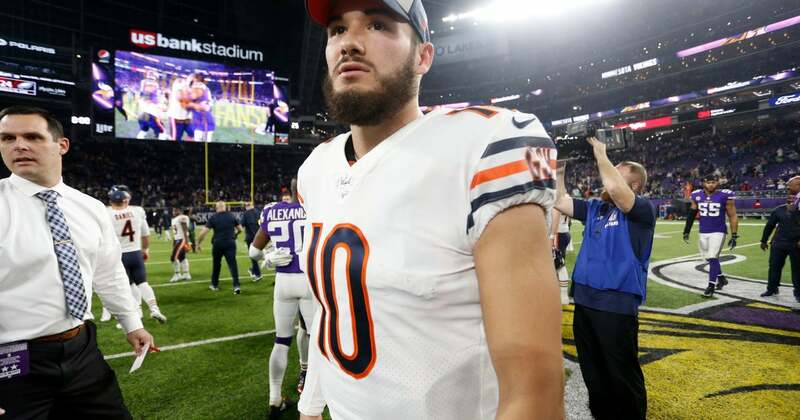 From four straight last-place finishes to hosting a wild-card matchup against the defending Super Bowl champion Philadelphia Eagles, it’s been quite a transformation for the Bears over the past 12 months. A busy offseason that started with former coach John Fox getting fired and ended with the blockbuster trade for Khalil Mack has paid off in a big way. Now, it seems anything is possible. But as far as Nagy is concerned, it’s business as usual this week. What the Bears (12-4) are doing seems to be working quite well. They more than doubled their win total after going 5-11 a year ago while posting their best regular-season record since the 2006 team went 13-3 and reached the Super Bowl. The Bears refused to let up in a 24-10 victory at Minnesota that knocked the Vikings out of the playoffs. They went with quarterback Mitchell Trubisky the whole way and only held out previously injured starters. With Philadelphia also beating Washington, the Eagles claimed the final wild card over the Vikings. That sets up a playoff matchup with no shortage of story lines, starting with Nagy going against his friend Doug Pederson. The two worked together under Andy Reid in Philadelphia and Kansas City. Trubisky will be making his first playoff appearance, and there will be brothers on opposite sides — Bears guard Kyle Long and Eagles defensive end Chris Long. It’s been a tough road back to the playoffs for Chicago. The drought cost three coaches their jobs and led to shrinking crowds as fans’ frustration mounted. Chicago is making its first playoff appearance since the 2010 season, when it won the division and lost to Green Bay in the NFC title game. The Bears fired Lovie Smith after going 10-6 in 2012 and continued to unravel from there. Marc Trestman lasted two seasons. Fox was let go after three seasons with a 14-34 record, a .292 winning percentage that ranked as the second-lowest in franchise history. But look at the Bears now. A team that started the season by blowing a 20-point lead against an injured Aaron Rodgers in a loss at Green Bay has its sights set on a Super Bowl run. The Bears gave up a league-low 17.7 points per game during the regular season and ranked third in total defense. No team forced as many turnovers (36) or intercepted as many passes (27). And though the offense has been inconsistent in Nagy’s first year, there has been growth, particularly from Trubisky. He has a 109.7 rating over the past three games, completing just under 76 percent of his passes for three touchdowns without an interception. NOTES: Nagy said he hopes Long can play the entire game after being in for 27 snaps on Sunday. … Nagy sounded optimistic WR Allen Robinson (ribs), S Eddie Jackson (ankle) and LB Aaron Lynch (elbow) will be available after missing the Minnesota game. “I’m hoping they’re all ready to go,” he said. … Nagy also downplayed the left shoulder injury WR Anthony Miller suffered against the Vikings, saying there’s “nothing significant there.” WR Taylor Gabriel also hurt his ribs, and DE Roy Robertson-Harris had “a little whiplash from enemy fire,” Nagy said.